The Steele Avenue yard is a small classification and maintenance yard. The center section is 6x long by approximately 12" deep. The track spacing of the mains is 25mm. The yard can be put in a layout with the use of a pair of 25/33 adapter modules. These modules include extensions to the yard lead and arrival/departure track. The yard is also the center of an approximately 11' x 4' complete layout. In this case the layout is operated from the yard side. The yard is based on a plan published in Kalmbach's Model Railroad Planning 1997 annual. In it David Barrows illustrated good yard throat design by giving four small yards as examples. These were shown as three four foot by eighteen inch "dominoes" in HO. This particular yard was based on one built by Tony Steele (hence the name) which follows AT&SF prototype practice. 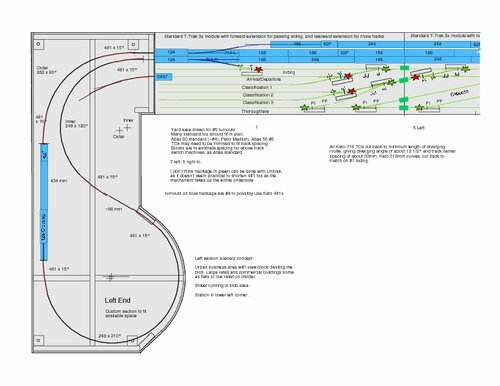 PDF of track plan of full layout. Click to open and see the rest.